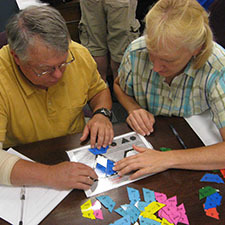 The QuarkNet Summer Institute at Purdue is provides professional development open to secondary teachers of physics and physical science, ICP, earth science and astronomy, engineering, statistics and mathematical sciences. 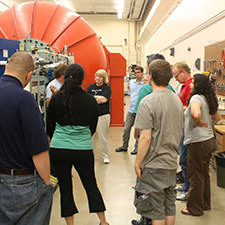 The five-day program includes a variety of experiences to learn more about high energy particle physics in the context of cosmic rays – radiation coming from space – and ways in which data can be collected, modeled, interpreted and applied to everyday situations. Learn about different kinds radiation and the materials and devices that can be used to measure them. Learn how to use and do experiments with a cosmic ray detector (for example, to measure the rate and lifetime of particles bombarding Earth from space). Meet and become a part of a community of STEM teachers with similar interests. Learn ways in which other STEM disciplines can be integrated with their own curriculum. Engage with researchers in topics related to both theoretical and practical applications of cosmic ray and particle physics research. Develop a deeper understanding of the Standard Model and how what we know may be challenged by new discoveries. 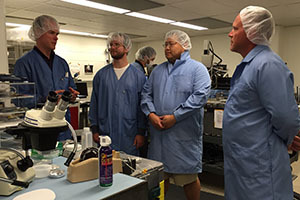 Tour laboratory, research and clean room fabrication facilities. Bring a student team to MasterClass for a real CMS research experience. 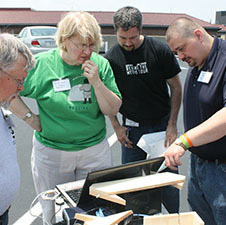 In addition to program materials, Purdue's QuarkNet Center provides participating teachers the opportunity to use a cosmic ray detector in their own classroom for instruction and/or independent student research. Teachers receive a stipend and credit points toward license renewal and advancement. Applications for the QuarkNet Summer Institute will be accepted in the order in which they are received. Space may be limited. The information requested is aimed at helping us provide meaningful experiences for a diverse demographic of participants. Your participation in QuarkNet program is not limited or determined by years of teaching, subjects taught, or prior research experience. Come join us! Please submit your application by June 1, 2017.